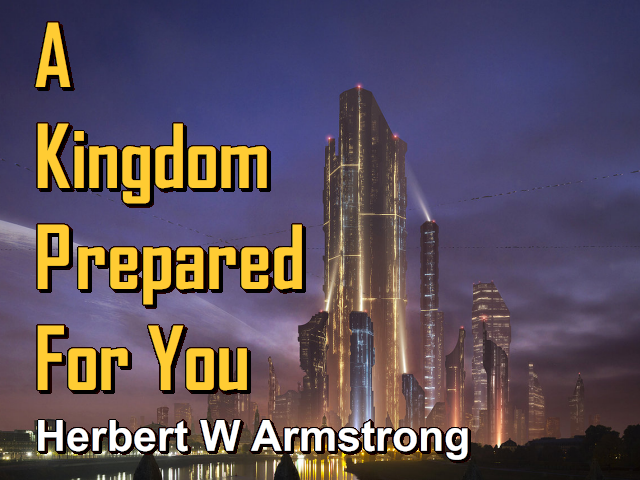 This is Herbert W Armstrong with the Good News of the World Tomorrow. And you know we could have good news today. In spite of the fact that you don't read very much good news in your newspaper, and you don't hear very much in newscasts, either on radio or television. You know things could go very well for us. We all have a lot of troubles, we all have a lot of problems. Most of us have a lot of financial troubles. And I've been telling you the way out of a lot of them. But you know we've been going through this book here to find out where Jesus Christ has been for 1900 years, and what has He been doing, and what's He doing today. Apparently He left the earth here 1900 years ago. We find in the Bible that He did, and that He went to heaven. And a lot of people don't seem to think that we've heard anything about Him since. He's just gone way off somewhere. And so they talk about a dead Christ hanging on a cross. And once a year, talk about a Christ child, a little baby in a manger, because there wasn't any room in the inn. But not very many people think about the Christ at the right hand of the throne of God in heaven, and what He's doing up there now. Now is there anything to prayer? Does it do any good to pray? Is it really practical, that is, do you really get an answer? Is there anybody there listening? Is Jesus Christ alive? Is He at the right hand of God? Is He our High Priest now? Is He on the job now? Or is He like the professor emeritus that used to do great things, but has grown old and feeble? Or else He's gone way off so far, that He just isn't around anymore. Or that He can't hear you - maybe He's too far away to hear you. He tells you to come boldly to the throne of grace in a time of need, when you get in trouble, or anything. That He's right there to help you. (Hebrews 4:16) Do you believe it my friends? Did you ever try it? And do you get the result? Now if you don't, there's a reason. But I want to tell you, it is a practical thing, and it's the most valuable thing in all life! It's something that, let me tell you, all the money of the Ford and the Rockefeller millions, or billions, or whatever they may be, could not buy. Oh, you'd think it was wonderful if you could have all of that. You know, my friends, if you had all that money, you couldn't buy with it, the benefit of answered prayer. If you only know how it works. But not very many people know how. Now there isn't any real trick about it. The only real trick is that you have to do something that is a little more difficult than most people are willing to do. In fact it's the hardest thing for anyone to do. Now that you have to do first, and it's the toughest, hardest thing for anyone to do. You have to admit you've been wrong all your life. You have to admit you've been thinking wrong, believing wrong, doing wrong, all your life. Now maybe that's a little too tough for you. That's too tough for most people. I think frankly, it would have been too tough for me if God Almighty had not beaten me down, beaten me down to a pulp, so to speak literally. Beaten me clear down into poverty, after I had been making more money than the governors of most states when I was still in my twenties. I thought I was somebody. I was a cocky, conceited young fellow that was, well - I was just simply the most important man in the whole United States. Well not only that, in the whole world as a matter of fact, when I was in my twenties. I was doing alright - so I thought. And God had to knock me down. He had to take all that away, and take all the conceit, and all the self-confidence out of me, and everything else, until I felt I was not only whipped, I was a failure. I woke up now, and I never had been important, or able, or any of these things I thought. I used to think I was brilliant and all that sort of thing, and now I came to see I wasn't. I was just a burned-out hunk of junk. So finally I admitted I'd been wrong when I was beaten down. And most of you have to take a beating like that before you'll do it. And I can't say that I'm any better. I don't know, maybe you're better than I am. Maybe you've been willing to make a real surrender to God Almighty, and admit how wrong you've been, and take your licking without having to be beaten down first. I've known people that had been wealthy, and as long as things were going along alright, they didn't need God. They had no use for God at all. And then adversity comes along, and ill fortune and they lose everything they had, they're stark, stone broke, they hit the gutter. Then they began to cry out to God for mercy. Then they'll turn to God, but even then, not all of them are ready to really surrender. They just want God to come to their rescue, and rescue them. Now when you surrender to God, He's your Lord and Master and you have to obey Him, but He's the kind of a Lord and Master who loves you. And real love is the kind of love that respects, and honors, and serves, and wants to help. That's the kind of love God has, He'll respect and honor you - insignificant and little as you are by comparison to God. He will, and He will love you, and He will want to serve you, and He'll want to help you. That's the kind of love God Almighty has for you, and He's there to serve you. But He's your Lord and Master and Ruler. But He's the kind of a ruler who serves as a servant, those whom He rules. But He only serves you while you obey Him, and He rules you for your good because He has infinite knowledge. He has a mind so much greater than yours. He has wisdom, that is perfect, an all encompassing knowledge and power. And He rules you for your good, not for His good. He's got everything. God is joyful, God is happy, God possesses all this universe. He created it all, He sustains and upholds it all, He set in motion every force and energy and every power, He controls them from His high heaven and His headquarters up there. He's at the controls, He directs everything. Because the Bible explains His will, and reveals it to you. Or are you just too busy to study it and find out? Every one of us has twenty-four hours a day. But you know we just don't have time to get this done, and that done, and the other thing we need to get done. Oh we're in such a hurry running around on this treadmill going nowhere - back and forth, back and forth. In a hurry, nervous, high tension. Where are we going? We aren't going anywhere. Are you really? Are you going anywhere, are you getting anywhere? Why don't you stop and analyze it, my friends, and see if you're getting anywhere? I don't think you are. You're not, unless you have found the way to happiness, unless you have found the way to success, unless you've found what your life was put here for on this earth. It was put here to grow, and to develop, in spiritual character. That means capacity and ability to accomplish, and that kind of accomplishment is the kind that becomes a blessing to everybody. That helps others, that is doing good. Then you share in it. Oh, I want to tell you, there is the greatest thrill in the world, when you've done something that has brought blessings and good and help to a lot of other people. That's really worthwhile. But as I say you need wisdom, and you need guidance, and you need help, and you need answers to prayer from God, quite often. And you can have them. And all the money in the universe couldn't buy it, but there is a price. And also He owns you again because He bought you back, and purchased you with His own death on the cross. He owns you because He made you, He owns you because He bought you again. And yet most of you are holding out, you don't want to give yourself to Him. Well you'll have to become like you were His bond slave. And He is, then, your Lord and Master all right. But He's the kind of Lord and Master that isn't trying to lash you on, to take away from you because He needs what you've got. He doesn't need anything from you. The one thing that He needs is to manifest His love on you, just shower it on you, and His blessings. And give you wisdom where you need it, so you'll do the right, instead of the wrong thing. Make the right decision, show you the way out of your troubles, deliver you out of all of them. Supply your every need, see that you get the breaks that you ought to have. But you have to pay the price. And then you have to really believe and trust Him. All those things you have to do. And still now, some people will do all of those things, not very many, but some, and they find they have their prayers answered and they find that God is really there. I've found it. And then a time comes, someone is lying very desperately ill. And you can find a promise in the Bible that God has promised to heal. Now if you want to know what the Bible does teach about it, and whether God heals. You know Christ healed the sick when He was on earth. And does He still do it today? Or was that just something for the time then, or is it all a thing of the past? Write in for our booklet on 'Healing.' I mention that every little while on this program. And if you don't understand that, write in for our booklet on 'Healing.' and you will - it'll make it plain, you should read a lot of it in your Bible, beside. And you'll see right there in your own Bible that God has promised to heal you. Of course you have to obey Him, and you have to believe, and trust Him, that's true. Well now here we are in the very faith chapter of the Bible that tells you about faith. We've been on it now for several broadcasts. There's so much about this thing; there's nothing more important in your life than this thing of faith. Why faith, my friends, is the thing that will free you from your fears and worries. You know you're lugging them around. In other words, my friends, you don't see what you have faith you're going to have. It means you haven't got it yet, then, when you have faith. So after you get it, you don't need to have faith. Now some people have faith for, maybe, five or ten seconds. Some people will have faith for, perhaps, an hour. Some people may have faith for one or two days. But if God doesn't get busy and jump at the crack of your whip, and do just what you've asked God to do as if you're giving the orders to God, and if He doesn't do it right away you say; "Well God just didn't hear me and answer me." Oh, how many times He's delayed the answer for me. I had an answer so quick, quicker than you can snap a finger. Where I had to have it, and where it was necessary, and God knew it was, He gave me the answer immediately. Why I remember one thing that was one of the greatest trials and problems I ever had in my life. Well I took it to God; I always do. And I had His promise. I could find many promises in the Bible that I'd get the answer. But I wasn't getting it, and a month went by, and six months went by, and a year went by. And I didn't have the answer. And then two years went by. And He hadn't done a thing about it yet. And you know I used to turn back here to the Psalms where I found many promises for the same kind of a trial that I was going through. David had had the same troubles I had. And I certainly could understand why David had prayed, "How long, O Lord; how long before you're going to answer?" (Psalm 13:1) Why it just seemed to David that God was never going to listen and answer. So I began to pray like that. I said, "How long , O God, are you going to keep me waiting?" Well I read that this test of faith was going to work patience, and I certainly had to learn to have a lot of patience. Well, I don't know, it was three or four years, or maybe five - finally God answered in such a dynamic manner that really astounded me. It wasn't the manner in which I thought He would at all. It wasn't the way that I expected or had asked at all. You know you can't tell God how to do it. If He's promised to do something, you rely on Him to do it, and He'll do it. But He'll do it His way; He'll do it in His time, not when you want. So faith is what you have to have 'til you get it. It's "...the evidence of things not seen." (Hebrews 11:1) Faith is the evidence on the witness stand. Do you believe it? Then you're going to make the decision. You're like the judge and the jury. And you're going to make the decision, and you're going to make it on the evidence. Now one evidence is doubt, one evidence is what you see, and if you depend for evidence on what you can see, you haven't got it yet, you say; "Well, I'm going to render a verdict: God didn't do it, God was unfaithful. God made a promise in the Bible, God lied. He didn't keep His word, and it's a written promise." In other words, matter which is seen, was not made from matter. It was made from things, but the things that don't appear. In other words, it's speaking of invisible things, or spirit. He offered the blood of a lamb, which was a type of Christ. He believed God, that the Messiah would come. And he showed that belief by taking a substitute and offering it. That was faith. Cain didn't believe it at all. Cain said, "I don't have to trust in the dead Christ, that maybe He'll come some day, and maybe He won't. I doubt it." Cain said, "I doubt it." Cain said, "I think I can work out my own salvation." Cain said, "I'm going to lean to my own human reason. I'm going to work out my salvation myself, by my own works and what I can raise out of the ground." So he brought the fruit of the ground, what he had raised. His own efforts didn't save him. Cain was a murderer, he was a liar, he did a lot of things he shouldn't. Now a lot of people say, "Well, you see Cain trusted in his own works. There are no works." Is that so? Cain just didn't believe God, he lacked the faith. This is the faith chapter. "...Abel offered...a more excellent sacrifice..." (Hebrews 11:4) Abel did something, there was works, only Abel's works were the right kind of works, that showed faith in God and obedience to God in doing what God had said. Cain showed disobedience, Cain showed lack of faith. Cain had works, but his works were the wrong kind. Abel had works, but Abel's works were the right kind. Do you see that right there in that verse? Alright, so that even though he is dead, and he is dead, yet he speaks by his faith to you and to me. And here it is in the Word of God, speaking to you right now. He did something about it. Now we come to Abraham. And all the rest of them scoffed at old Noah back there building that ark. It did look like a silly thing. Why no flood had ever happened, it couldn't happen here. I guess you think, maybe, the things that are in prophecy for the United States just can't happen here. They are going to happen! Notice it; by faith Abraham obeyed. And you read back in James that Abraham proved his faith by his works. Don't tell me that it's faith without works. Here's the faith chapter in your Bible, read it my friends. Every one of these men given as a case history, here, every one of them proved their faith by their works. But it was the right kind of works. A city that will come down prepared. Jesus is in heaven preparing it now, and it's going to come right down here on this earth. And we're going to get into it if we have that kind of faith, the faith that comes as a result of surrender, of having been conquered, and of really believing in Christ, and of obeying God. As a result of that faith, my friends, you and I wouldn't be here alive today, except for that faith that they had. Believe it or not. Now this 'country' is the Kingdom of God. Oh, how much more wonderful than this world today. Do you love this world? Do you think this is a pretty good world, huh? Is that what you think? With all of its aches and pains, its sorrows, its unhappiness, its suffering, its empty lives? Yeah, I suppose some of the gadgets and toys and things you tinker around with, and some of the pleasures and amusements, have got you all interested. They glitter and they have a lot of glamour for you. But they're going to leave you with a headache, you know. They're going to give you a hangover, they're going to boomerang. This world isn't any good. When will you wake up and learn that? But here is one they had faith in, they looked forward to whose builder and maker is God. And they sought a country that was really something, and you can have it too, with them. That was this world, Babylon, they came out of Babylon. Oh, it was rich. They had their amusements and entertainments too. They just didn't have the same kind of gadgets we have today, but they had things we don't have today. You just don't know anything about it. You weren't there, were you? Well they had them. But Abraham gave all that up to come out with God. And you're going to have to give up some things if you're going to walk with Christ. So they gave all that up. Yes, the place prepared right here on this earth. That isn't the way you've been thinking, is it? Well that's what your Bible says. So here it is, a city. He didn't doubt, he obeyed. Oh here was obedience, here's doing, here is works. The right kind of works, that's obedience. Obedience and faith go hand-in-hand. You have to prove your faith by your obedience. That was faith in something he couldn't see. That was just faith in the veracity of God's Word, in the truth that God cannot lie, in the power of God. Have you got that kind of faith? A lot of you have been hearing that there's no works. You think you can be saved by the kind of faith that does nothing. And you couldn't be more wrong. I tell you some of you need to check up a little bit and see what kind of ground you're standing on, because your Bible says that; "...all nations have been deceived..." (Revelation 12:9 paraphrased) in this day and age. They have been deceived. Now a deceived person is an honest person. I don't doubt that you're perfectly sincere and honest. But how do you know what's right? Actually, you'll have to study your Bible if you're going to really know, because God Almighty, the Creator, is the One who set down these laws of right and wrong. Those are laws that are living, they're in motion, they're real, they live, they're alive. They were set in motion for your happiness. If you live according to them you'll be happy. And if you break them you're going to be miserable and unhappy. And most of you are carrying around a lot of misery, a lot of headaches, a lot of heartaches, a lot of troubles. Now if you just had the right kind of faith you could be rid of them. Write in for this booklet on 'Faith.' Write in for that booklet on 'Did Elijah go to Heaven?' And Enoch, where are they? Did they go to heaven? Now write in for those booklets. There's no charge.